I’d like to think that anyone heading to medical school – whether thinking about it, applying, or already starting their studies – is often asked THE question. It comes in several variations but most are along the lines of: “what made you want to become…” or “why do you want to be…” or “how did you know that you wanted to be…” a doctor. Ever since I was little girl, I’ve had pretty grandiose ideas about what my future career would be. I once came across a 1st or 2nd grade class assignment, from when I was about 6/7 years old, where I had illustrated and written – in my barely legible, learning-to-write handwriting – that I wanted to be an astronaut. After that my mom started law school and I wanted to be a lawyer – just like my mama! Not long after – and I don’t know exactly when – this changed to doctor. People I met in my daily life would ask me the quintessential question for children: what do you want to be when you grew up? To which I would answer, “A doctor. The kind that does everything.” If my mom was there she would fill in the title that I never managed to say, as it was too rich for my pre-adolescent vocabulary: general practitioner. Once I decided that I was going to be a doctor, I knew that I had to test myself as much as possible – just to make sure that this was what I really wanted. I began studying everything that happened during my doctor visits, which wasn’t very exciting in the beginning. The most I did was stare intently at the entrance of the needle into the veins of my antecubital fossa (the crook of your elbow…. or elbow pit as I like to call it). I knew then that there would be much worse things to “handle” in the future if I was to become a doctor. My biggest can-you-handle-being-a-doctor test came when I was a freshman in high school and it requires a bit of a back story. I have hyper mobility syndrome, which, put simply, means that my joints stretch farther than normal. The best instance of this is my left knee, which I dislocated for the first time while playing kickball in 3rd grade. I was taken to the hospital in an ambulance and had to use crutches for a couple of weeks (which is maybe where I got my first taste for medicine?). 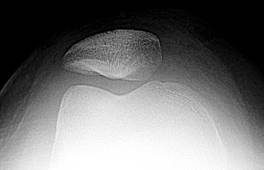 After this initial dislocation, my knee cap became no stranger to slipping out of its joint. If I got up the wrong way, skipped, hop or ran the wrong way, it would dislocate and I would sit in whichever spot I fell until I regained the strength to get up and walk again. These numerous dislocations took their toll over the years and when I was 15 it dislocated for a last time while I was log wrestling with my best friend Amy. There may be a more technical term for it than “log wrestling” but it is essentially where you and an opponent stand on top of two huge, parallel logs and see who can stay on their log the longest. Well, I slipped off my log and my left leg got jammed between two smaller logs, dislocating my knee. My orthopedic surgeon later explained that, with this dislocation, I had torn a weakened muscle off of my knee cap and needed surgery to repair it. You have shallow joints and have dislocated your left knee so many times, and over such a long period of time, that there is a good amount of damage in the area surrounding the knee-joint. You have a muscle that runs down from your hip to your knee. You have torn this muscle and I need to remove the section of it that is too stretched out to offer your joint any support. I will cut off about 4 inches and then reattach it. I will also need to perform arthroscopic surgery on either side of your knee. I will make a two small incisions and go in with a small camera. You have two tendons that run down the sides of your legs and stabilize your patella (knee cap). The one on the outside of your knee has become too tight and is actually pulling your patella out of the knee-joint. I need to trim this one so that it loosens up. The one on the inside of your knee is too weak and isn’t really doing what it is supposed to. This one needs to be cut and retied so that it is tighter. Now, as I wrote earlier, I was about 15 when he explained this to me so the details may not be 100% accurate. I’ve looked up my surgery and at diagrams of the knee several times since and find that I can’t quite connect my understanding of the surgery with what I’ve found online. However, I have repeated the details of my surgery to about five doctors since and have yet to be corrected (though that could be because they don’t want to waste time explaining it to me). The most feedback I’ve received after explaining my surgery is that the surgery is no longer performed due to its high failure rate. I expect that I will understand my knee surgery much differently after medical school. Here’s where it gets interesting. Watching myself get basic shots and vaccines wasn’t cutting it in terms of challenging my ability to handle being a doctor. I needed something bigger… something more disgusting! So I asked my orthopedic surgeon if I could watch my knee surgery. It was definitely unlike any request he’d had before, but he agreed. One thing you have to remember is that this was back when managing to upload a single, grainy picture onto your computer was an amazing feat. This was three years before YouTube and Facebook were created. A quick internet search today will bring up any surgery video, including the exact surgery I had, within seconds. On the day of my surgery, I was only partially anesthetized so that I would be able to follow along with the procedure. I was only able to watch the arthroscopic surgery on a TV screen above me, as it is quite hard to study your knee while laying on your back and temporarily paralyzed. But it was amazing. Simply…amazing. The human body seems so sacred at times. We are beings of life, of emotion and passion. There is a mental connection and response to every part of our body. We are aware. And to see the inside of my body, to see someone scraping and prodding and poking, and have no mental connection or response to it was unlike anything I have every experienced. Something changed in me then, something that I wouldn’t really appreciate, much less fully understand, until now. It’s the ability to look at the body as a biological machine, as a combination of it’s billion, if not trillion, functioning parts. To look at HOW we work. To assimilate our bodies with cars and moving toys. To look at the human body just as it is, outside of the presence of the soul. I’m getting excited just writing about it now. It’s fascinating. Truly and utterly fascinating. One thing I’ve learned about myself as I’ve grown older, mostly through people pointing it out, is that I have a pretty extreme sense of empathy for not only living creatures but even material things – and this isn’t always a good thing. When I picked flowers as a little girl, I would tear out a single hair from my head and lay it where the flower had been, as some sort of exchange. When Skjalg and I go for walks in the woods, I will move snails out of the way. Once, on a walk in the rain, we came across a writhing worm in the dirt path. He told me that it was probably being tortured by the intense vibrations of the rain drops. I felt so bad for the worm that I picked it up and placed it in a mushy mud section on the side so that it could escape more easily. Expressing sorrow or sadness about anything in my own life isn’t nearly as easy for me as for expressing it for something is someone else’s, whether in real life or movies (even cartoons!). Christian walked in on me crying once while I was watching Disney’s Tarzan – one of the parts in the beginning where Phil Collins is singing… maybe I never matured past 8-years old? This is how I know I am going to be a doctor – my passion for the body, my ability to handle “grossness” and my empathy for people, not just for their conscious self, but for their biological beings. 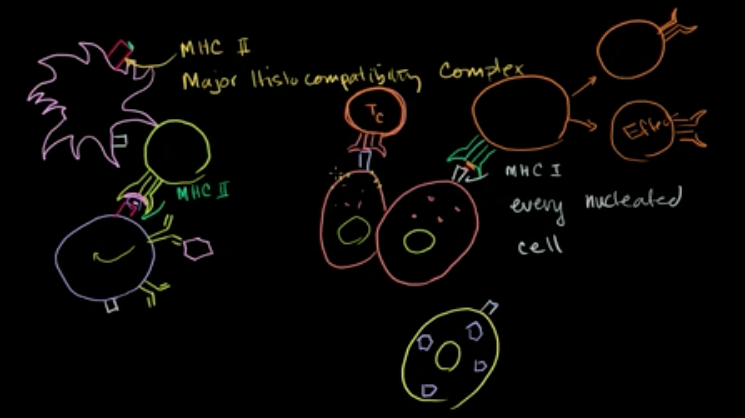 While studying the immune response for the entrance exam, I could not stop raving about the individual cells involved. I got so excited reading about them, learning what they do and the role they play in the human body. “Skjalg! Skjalg! Did you know that cells that are damaged or infected will actually present this information on receptors on their surface??? They are informing macrophages (the cells that digest damaged cells) that they are infected and need to die! They’re essentially committing suicide by informing the body that they are potentially harmful!” I have a genuine physical response to the excitement I feel when I learn about how the body works. Why do I want to be a doctor? Yes, I want to help people and yes, I love science. But honestly, the main reason for me is that I want to know everything I can about how the body works, I want to understand it, appreciate it and figure it out. I’m passionate about the human body and I feel empathy for its individual parts, even down to its little mast, t- and b-cells. I’ve always thought that the main surgery I had was called patellic realignment. Google informed me that I am mistaken and the surgery is in fact called patella (or patellar) realignment. 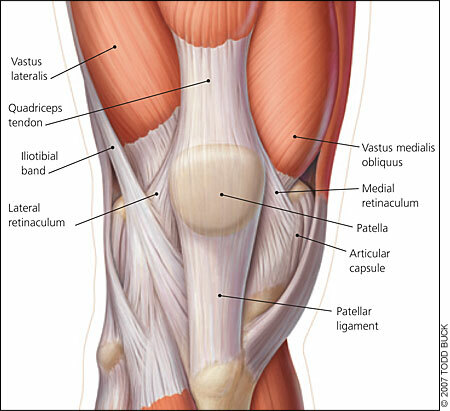 After looking more at the anatomy of the knee, I suspect that it wasn’t a muscle that I tore, but possibly the quadriceps tendon – meaning that I misunderstood what the surgeon had explained to me. This tendon attaches the quadricep muscles to the knee. The Shelbourne Knee Center says that there are two types of patella realignment surgery: proximal repair and trillat procedure. My arthroscopic procedure seemed most similar to the proximal repair. This procedure requires that the surgeon make a small incision on each side of the knee cap. 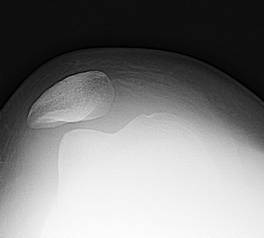 The patella is stabilized by soft tissue (the retinaculum) and after a dislocation, the tissue on the inner side of the knee is torn or stretched and the tissue on the outer side is shortened. The proximal repair procedure tightens the stretched retinaculum on the inner side and loosens the shortened retinaculum on the outer side. I have yet to find a source that explains the surgery that involved reattachment of a muscle (or tendon) but will definitely post about it when I do. § 2 Responses to What made you want to become a doctor? being more interested and ready “to go on”. With such an attitude I am sure you will come trough with top notes. I am convinced you will be a superb physician – . I have noticed that you have listened to my advice to prepare for the Hungarian culture and history, which may be of great value in the years coming. I adore your efforts and preparation. Yours Terje. « First round of books delivered! You are currently reading What made you want to become a doctor? at Buda-B.